I have mentioned in a previous post how I picked up sourdough baking last spring. What defines sourdough baking and makes it critically different to any other cooking specialty is that you don’t just embark on its practice, you rather start a partnership with its material object and its very real sticky substance. It’s not an abstract hobby and it comes with all the responsibility of adopting a living being (mono-cellular as is) that needs to be looked after. You think that buying a yearly subscription to your local gym will feel binding enough to actually have you going to pilates at least a couple of times per week, but knowing that your instructor won’t starve to death if you desert your class will probably entitle you to keep watching tv-series instead. Try ignoring your cat when it’s hungry, on the other hand, and let me know what really gets you off your couch. The comparison with having a pet is not entirely ironic. Keeping a mother yeast colony does require commitment and a change in habits. 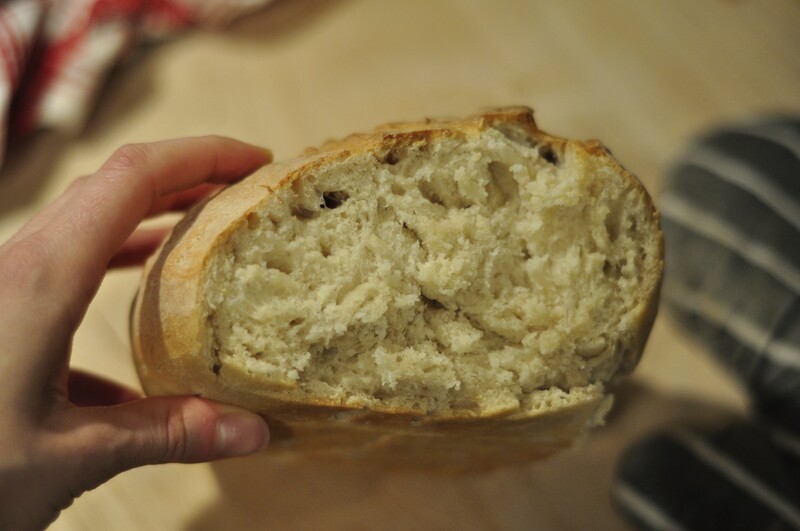 However, even to an instinctive cook and unruly cookbook user like me – who can’t resist the temptation of tweaking, intercrossing and disrupting existing recipes – adjusting to the discipline of sourdough maintenance was surprisingly easy. Tip: give it room to grow or it will take it anyway! Mother yeast is a compound of living microorganisms that will perish in a smelly, viscid, greyish pond if you don’t feed them for too long. Since this new pet of yours turns out to be quite unpretentious and low-maintenance after all – it only feeds on flour and water and won’t complain if you don’t feed it for 7-10 days – it would be very cruel to deny it its weekly meal. How insensitive must you be to watch it fade in your fridge, while you peek in every few hours to feed yourself? Especially if you consider the endless supply of naturally leavened baked goods that you can get out of your collaboration with this modest gooey friend. Keep it refrigerated, in a jar with a non-hermetic lid: it needs to be able to “breath”. Feed it weekly with quality flours (stone-milled organic flours are the best nutritional choice for it). What I call feeding or activating your mother yeast is nothing more than mixing it with flour and water and then letting it rest for a few hours. If it doubles its volume during its “meal”, over 4 hours, it means it’s in good health. Always bake with activated starter (after the four-hour feeding phase). Don’t forget to store part of the activated starter in your fridge, to preserve your colony till your next bake. The maintenance routine of mother yeast can be summarised in four easy steps, and I put it in an infographic. Why not print this out and stick it to your fridge? Despite all this talking of mother yeast, however, I am not a bread-addict. What really keeps me charmed about sourdough is its binding power, and I’m not (only) talking about baking. Unless you start your own mother yeast colony from scratch – which can be a difficult and uncertain process, the only way to obtain some sourdough starter is receiving it as a gift from another baker. That’s how it worked over the centuries and across countries and cultures, everywhere some sort of leavened bread belonged: people would get some starter from their neighbour to bake bread, transmit their knowledge to others, maybe share a communal oven. Sourdough would work as a binding agent for people as well as ingredients; baking was a community thing. After all, concepts like com-pan-y and com-pan-ion are etymologically and philosophically rooted in bread (panis in Latin). Companionship is literally the quality of those who share the same bread. New technologies can help revive good old habits, sometimes. That’s how I decided to use As Soup As Possible Facebook page to create an offline connection based on naturally leavened bread. Last October, I created a Facebook event inviting people to share my sourdough starter and the knowledge I acquired about baking with natural leavening, on given dates in the month of December. I asked the participants to join me at one of the weekly meetings I arranged at a cafe in my neighbourhood and bring a jar. The response was very warm, and I even found a friendly sponsor in Commandeursmolen, a Dutch family company that runs an ancient grain mill in Limburg. They produce the organic flour I have always used to feed my mother yeast and many more, with sustainable methods and from selected grains. I simply gave them a call to let them know about my flour-consuming project, and they generously offered to donate two bags of their excellent product to support the initiative, which I could keep entirely free. The people who came collect their mother yeast were mostly approaching bread baking for the first time, but some of them had some baking experience on their side. In one case I even received some sourdough starter myself, from a lady who has been baking with it for two years. I baked bread with her mother yeast (the one in the picture) and it tasted and looked quite different to my usual bread, as a demonstration of how each yeast-bacterial colony has its own identity. Most of the bakers who got their batches of mother yeast (Elvira’s “children”) from me gave their mother yeast a name. I gave them my recipe for everyday bread and some of them started baking the day after the meeting and posting their creations on the event page. I was amazed at the diversity of their loaves, defying the fact they all came from the same starter and were made with the same recipe. Once again food showed the power of smoothly connecting people and their identities through its rich simplicity. So these are some of the people I am somehow sharing the same bread with, at this moment in time. Here are the faces of our little “companionship of the dough”. Cristina (right) and Iole (in the jar) started baking in May. Cristina is also my official dough-sitter in case I go on holiday for longer than a week. Thank you, Cris! Chloé learnt sourdough bread baking from me, last summer in Amsterdam. We met through Konnektid. A web developer, she didn’t bat an eyelid when I explained to her the methodic practicalities of sourdough baking. She and her mother yeast Maya moved back to France, where they still make a happy baking duo. Jean-Marie got his mother yeast from Chloé. He is baking in Bordeaux, with a starter he named after me. Merci, monsieur! Je ne suis honorée! Tatjana was the first to join my event on Facebook. As a prize, she got a jar of homemade breadcrumbs. It may seem quite a meagre reward but – hey – do you have any idea of what you can do with real breadcrumbs? Nora attended the giveaway in early December. She is an experienced home baker and completely into the sharing mood. Although nothing was requested in exchange of my mother yeast and informational material, she gave me a sample of her own starter, which I used to bake the bread you can see in the photo featured in this post. Thank you, Nora! Maurizio tried sourdough baking years ago. His old starter was also from Napoli and centenary. We wonder whether it was an old relative of Elvira’s. He named his new starter Fedra [citation alert]. I’m sure they’ll bake some Quality bread! David is going to share his mother yeast with his mother. He told us of how she used to collect mother yeast from her local community when she was young in Turkey. I’m not sure whether their doughs will rise thanks to Linda’s fermentative power or Etienne’s enthusiasm about baking his own sourdough bread! I got the impression Laurens is a very meditative gentleman. I am sure he will get the zen factor in mother yeast maintenance. And he left with …Brumhilda! There was a serious naming choice here, but to Dimitris it was a piece of cake, after naming his first child last month. G.’s nickname is Lila and she decided to share it with her mother yeast. I’m sure they’ll bake as one team! Marco is from Napoli (Italy) like Elvira and me. His first creation with his starter Giovanna was sourdough pizza. Who would have thought? Suzanne is an urban gardner. 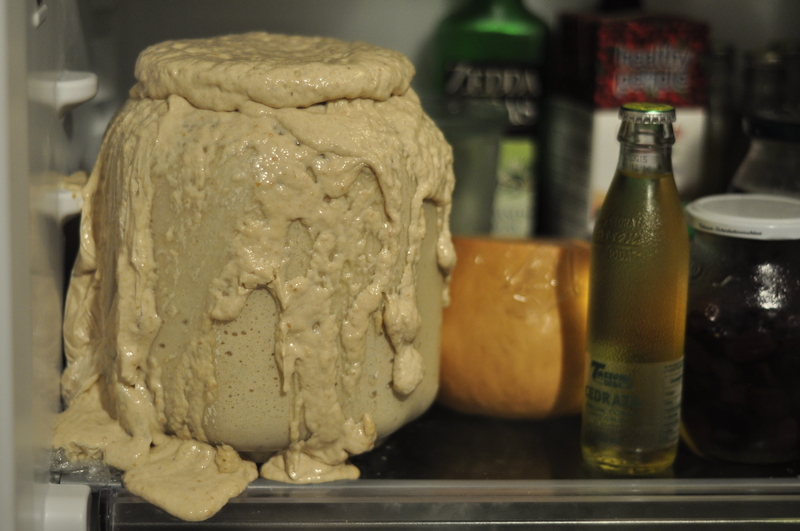 She obviously has a green thumb, on the other hand her previous attempts at sourdough baking weren’t successful. I hope her other thumb turns out to be beige (if the idiom “a beige thumb”, to indicate skilled bakers, is not a thing – well, I just invented it). Good luck with Amma! Goran is a busy man who decided to give sourdough baking a go. He’ll find out it’s not that difficult to make time for baking. Ralph highjacked an evening out with Sanna and took her to our mother yeast giveaway. I hope it was worth the detour! They both got their dough and continued their date with Elizabeth and Sannawannah (their starters). Tatiana will be baking with her daughter, our youngest baker so far. They named their mother yeast Chiara. I am sure that, regardless of the age difference, 10-year-old Vilma and centenary Chiara will get along very well! Her 15 months old girl just began toddling and wobbling around like an unstoppable little danger. Will baking help Dana recharge her batteries and handle her adorable little volcano? Carlotta works on shifts, sometimes overnight. We took some time to figure out a matching baking schedule. We were trying to work out the optimal starting time on night-shift days, when I was struck by an epiphany: sourdough baking can be a great opportunity for team-building, if you learn to delegate. In other words: when in need, use boyfriend-labour! Mattia made an appearance at our first giveaway night, then left in a hurry before I could even take a picture of him and his mother yeast, Adam. Two weeks later, he sent me a photo of a beautiful focaccia and this. They look happy together, don’t they? My mother yeast, Elvira, travelled with me from Southern Italy and hopefully its offspring will continue this journey to bring more joy and taste to more kitchens. That’s why I decided to track the development of her family tree from this point on, and make it available online to other bakers who might cross paths with her descendants. A couple of bakers from my “companionship” already shared their dough with other people. Just today I was told that one of them gave a piece of his dough (Linda) to a brewer friend of his. It turns out Elvira will contribute to brewing beer as well, who would have thought? This family tree is available online and can be updated by anyone joining it. If you receive a batch of sourdough starter coming from Elvira’s family, please contact me or the person who donated it to you. You will be authorised to edit the map with possible updates. Those who happen to be in Amsterdam on December 23rd – last date available – and would like to give sourdough baking a go are warmly welcome to join us through the event Facebook page (reservation required). The more the merrier, in the companionship of the dough! Thinking of you today! My sourdough starter you shared with me is alive and well and I bake a loaf every week. I now have another mother made of rye along the wheat one you shared. I have shared some of each various times. Last Sunday I shared the rye sour dough at a fermentation workshop and I hope I can direct some of the participants to this website. I’d be curious to meet your rye starter and possibly try some. I will be publishing a new edition of Elvira Bakes (my sourdough bakeoff) soon and I’d love to see you there with some of your creations. I hope your friends will submit the starter you gave them to Elvira’s family tree. Looking forward to your next event. I would be very happy to bring you some rye sourdough! Hello guys! Since I took my sourdough I didn’t always have time to play around for long baking sessions. 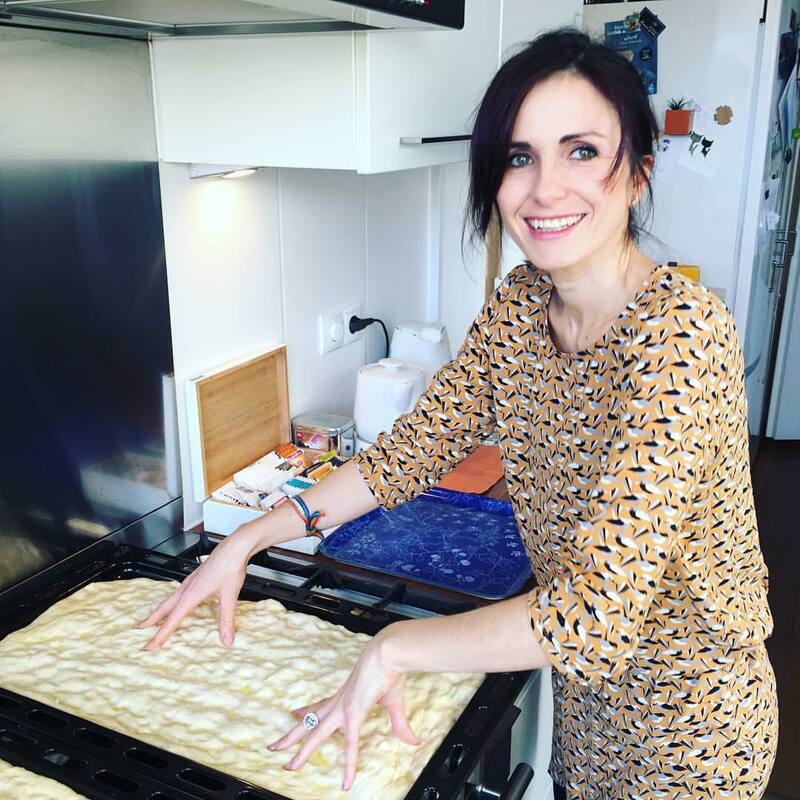 After few time throwing half of my Giovanna away for the weekly refreshment, I looked it up on the internet and I found hundreds of way to use the “old” rest of your friend to prepare extremely tasty products: grissini, piadine, crackers and much more! That’s a very quick and easy alternative not to waste our efforts in keeping our sourdough healthy and alive! Previous PostSharing and the city. Next PostTwo Indian Recipes – part I: Dal Makhani.